It's the beginning of the last month of the year so it seems like a nice time to start thinking about beginnings and to share this quote. "Where shall we begin? There is no beginning. Start where you arrive. Stop before what entices you. You will enter little by little into the entirety. Method will be born in proportion to your interest. eternal youth made of self collectedness and enthusiasm." is the clock image your creation? It is awesome! 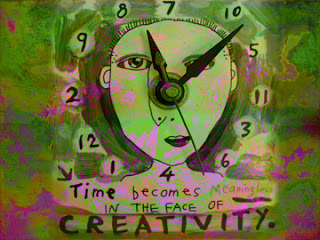 This is a clock I bought many years ago ... just put it through some photoshop hoops. I love the message.